Welcome back again! 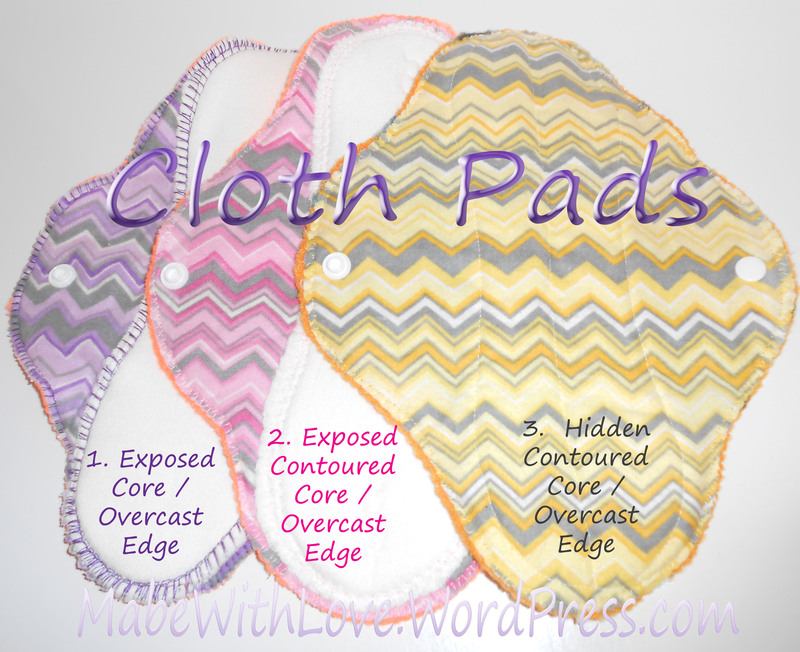 This is the third and final tutorial in a series of three showing you how to sew cloth pads with overcast edges three ways: exposed core, exposed contoured core, hidden contoured core. Today we will sew the hidden contoured core pad, the third pad pictured on the left hand side of the screen. The HiddenContouredCoreOvercastEdge pdf. Download by clicking the link. Follow along on your computer, or print out. Please do NOT sell the pattern. I have provided it free of charge to help mamas who want to try mama cloth but cannot afford it. For the pads shown, I have used three layers of bamboo fleece. Bamboo and hemp are good choices if you want a thinner pad as they are thin, but absorbent. 2-3 layers of bamboo or hemp will give you medium flow absorbency; use more for heavy, postpartum, or overnight. Welcome back! This is the second tutorial in a series of three showing you how to sew cloth pads with overcast edges three ways: exposed core, exposed contoured core, hidden contoured core. Today we will sew the exposed contoured core pad, the second pad pictured on the left hand side of the screen. The ExposedContouredCoreOverCastEdge PDF. Download by clicking the link. Follow along on your computer, or print out. Please do NOT sell the pattern. I have provided it free of charge to help mamas who want to try mama cloth but cannot afford it.